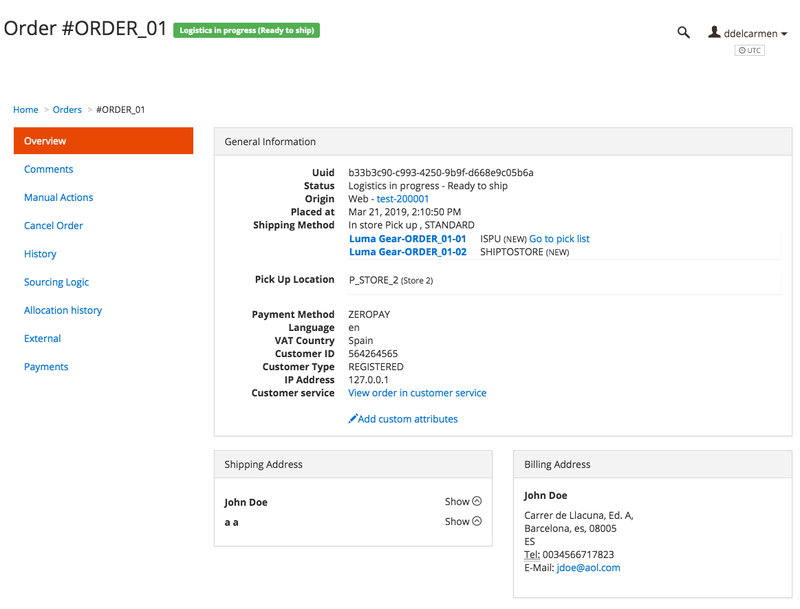 Find all of the details for an order in the Sales > Orders > order ID for a specific order in your Order Management System (OMS). Overview General information about the order, such as the shipping or the payment method. See Overview. Comments Comments for the order. See Comments. Manual actions Actions that you can perform manually for the order, such as Manual Soft Allocation and Request Order History Report. See Manual actions. Cancel order Cancel the whole order, or specific order lines. See Cancel order. History See the history of the order throughout your OMS, including the different order statuses along the way. See History. Sourcing logic Show the sourcing request and the sourcing details for the order. See Sourcing logic. Allocation history Shows the allocation history for the order lines of the order. See Allocation history. External External communications transmitted throughout the life of the order. See External. Payments See the payment details of an order. See Payments. In the Overview section you see a general summary of a given order. General information This section contains general information of your order as well as other information like the order status, shipping and payment method, country of origin and its VAT details or the date of when the order was placed. Shipping Address Shipping address of the order. Billing Address Billing address of the order. Items Order lines with the items placed in the order. Click View order in customer service to access the Customer service view. For more information about this view, see the Customer Service User guide page. In the Comments section you can see existing or add new comments for the order. 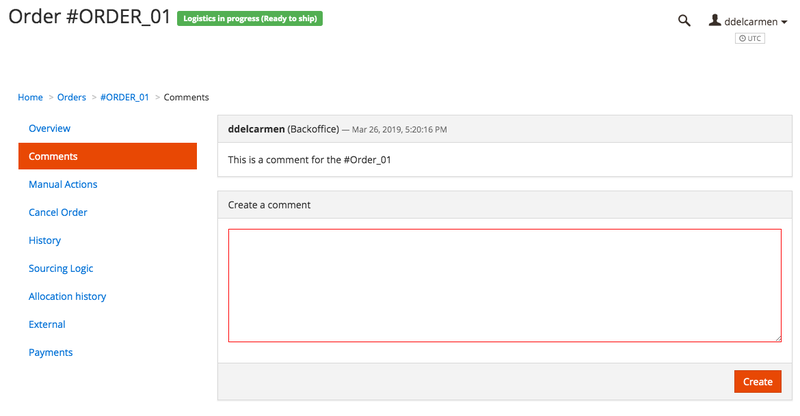 For example, a warehouse manager agent that updates the order can add a comment about it here. Manual sourcing Allows you to manually source an order line to a source with available stock. Manual soft allocation Allows you to force soft allocation for items in the order. 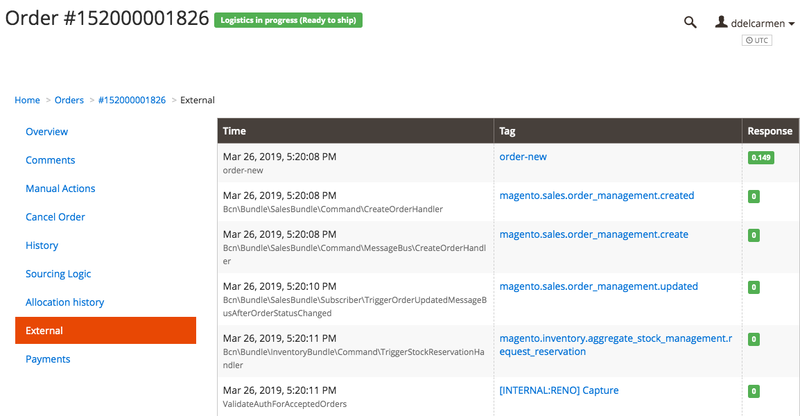 Generate a shipment request feed Allows you to generate a shipment request for the order or order line (if there is a different shipping method). 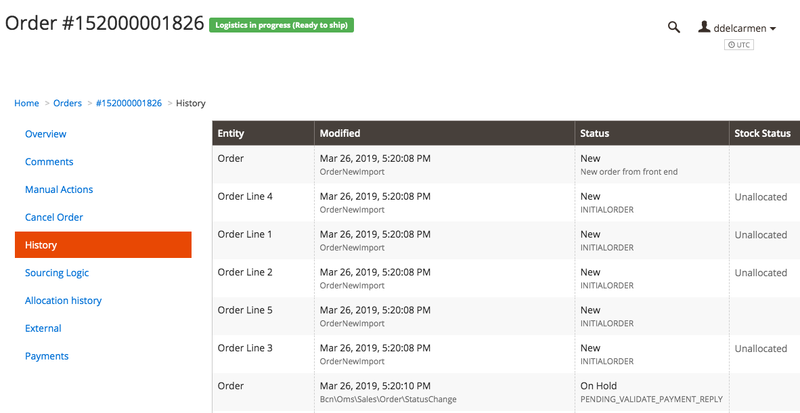 Request order history report Allows you to request an order history report for the order. Exports data to MAgento Bussiness Intelligence (MBI). For more information about the manual actions you can perform for an order, see the Customer Service User guide page. In the Cancel Order section you can cancel specific order lines of an order or the whole order. You can only cancel an order or specific order lines if the status allows it. For example, if the status of the order is PICKING you will not be able to cancel it, because you cannot cancel a shipment request. Cancelations must be initiated by the logistics provider. For more information about canceling an order, see Order cancellation. For more information about the cancellation flow, see Cancellation flow. In the History section you can see the complete history of an order. Entity Specifies whether this line represents an entire order or an order line. Modified Date when the entity was last modified. Stock status Shows the stock status for the specific entity. You can filter the order by any column. 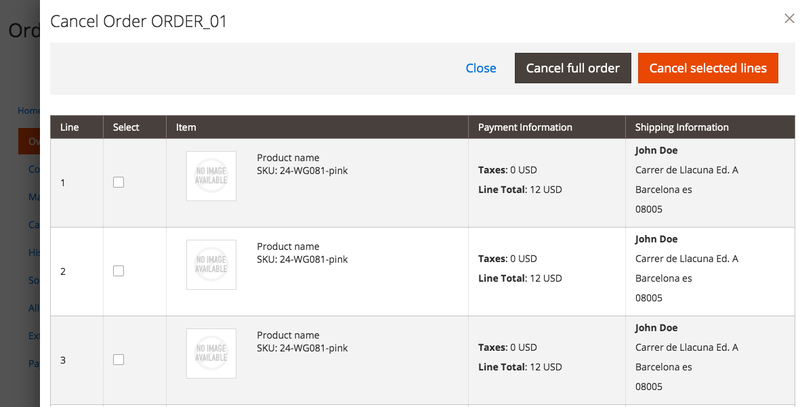 The Sourcing Logic section shows the sourcing request info for an order. Click View Details to see the Sourcing details and the Best sourcing option for the order and order lines, according to the Sourcing request and Shipping details. For more information about sourcing an order, see Stock & Sourcing. The Allocation History section allows you to view the history for all of the order lines, including information about stock status and allocation attempts per order line. Order line Order line number. Time Date when the order line was last allocated (or attempted). Event Where the allocation attempt happened. Allocation attempt Number of allocation attempts. You can filter the order by any column of info available. See Fulfillment for more information about allocation in your OMS. The External section allows you to view external communications that transpired during the course of the order. Time Date when the order was last modified. Tag Different messages that the order has received or sent during the course of the order. See Order status and Order flow for more information on specifications in your OMS. The Payments section shows all payments for an order. Time Date when the payment was placed. Event Last confirmed payment event. Status Status of the payment event. Amount Amount of the payment event. Gateway event ID ID of the event. 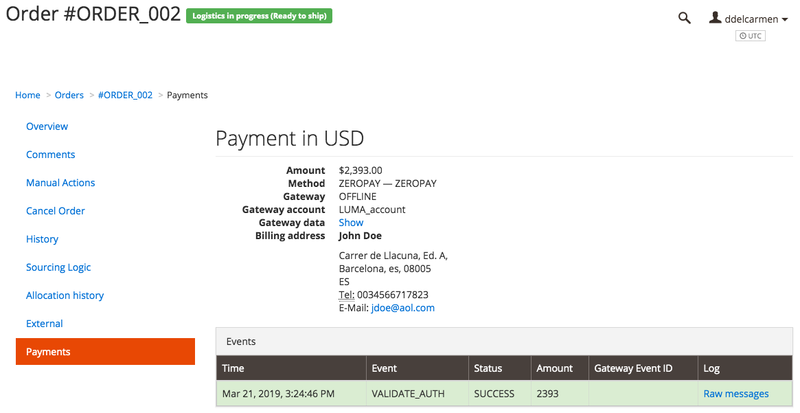 Log Raw messages received from the payment event. For more information see Payments.